GRANTSVILLE, UTAH (July 21, 2018) – Yoshimura Suzuki’s Toni Elias stalked Monster Energy/Yamalube/Yamaha Factory Racing’s Cameron Beaubier for 14 of the 17 laps of the Utah Motorsports Campus. Then he pounced, taking the lead with three laps to go and holding off the attacking Beaubier to win the Championship of Utah by .494 of a second on a hot sunny day on the outskirts of Salt Lake City. 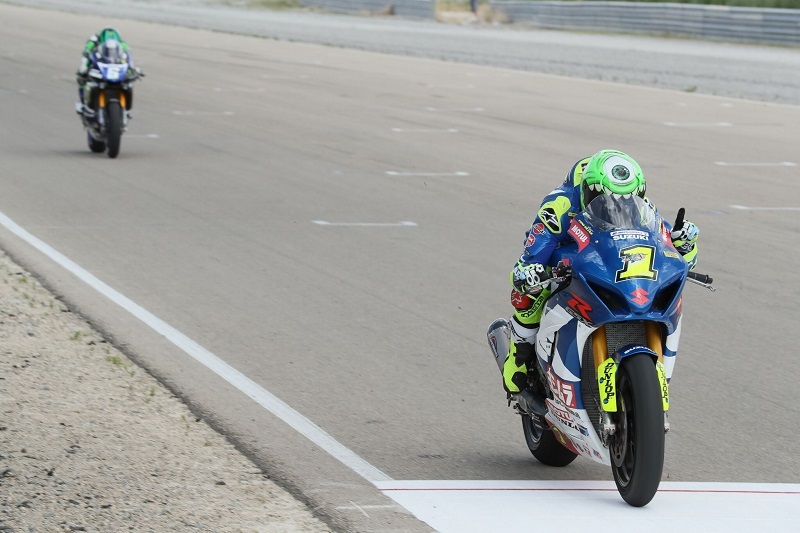 Elias’ sixth win of the season was an historic one in that it marked Suzuki’s 200th victory in AMA Superbike racing. And it was an important one for Elias and the Yoshimura Suzuki crew in that it stopped Beaubier’s four-race win streak and showed that the team had fixed what ailed them in the previous two rounds at Road America and WeatherTech Raceway Laguna Seca. It also moved the Spaniard to within a race of Beaubier in the championship as the defending MotoAmerica Superbike Champion now trails the two-time series champ by 24 points heading into tomorrow’s second Motul Superbike race at UMC. The race at the front only featured Beaubier and Elias with Beaubier taking the lead from the Spaniard on the opening lap. He would hold that lead until the 14th lap before he was caught a little off-guard by Elias going into turn one. From there it was a dogfight, with Beaubier making a pass on Elias on the final lap that didn’t stick. The margin of victory at the flag: .494 of a second. Beaubier admitted being surprised by Elias’ attack after leading so much of the race. The Californian starting from pole position after earning the spot during the Superpole qualifying session earlier in the day. Third place went to Attack Performance/Herrin Compound Yamaha’s Josh Herrin, the 2013 AMA Superbike Champion fighting off the advances of Beaubier’s teammate and M4 ECSTAR Suzuki’s Jake Lewis to earn the spot. At the finish Herrin was .974 of a second clear of Gerloff, with the Texan getting faster as the race wore on to put himself in position to challenge late. Lewis, meanwhile, had mechanical issues that slowed him in the closing laps. He ended up fifth, his sixth fifth-place finish of the season. Yamalube/Westby Racing’s Mathew Scholtz ended up sixth, well clear of SC-Project/KWR’s Kyle Wyman, who in turn was challenged from behind by Scheibe Racing BMW’s Danny Eslick. Genuine Broaster Chicken Honda’s Cameron Petersen and Omega Moto’s Geoff May rounded out the top 10 finishers. Beaubier leads the title chase over Elias, 223-199, with Herrin third on 151 points. Scholz is now 12 points behind Herrin in fourth place with Gerloff holding down fifth, 28 points behind the South African. Among the non-finishers were Yoshimura Suzuki’s Roger Hayden, who suffered his fourth race crash of the season; Bobby Fong, who pulled out of the race on his Quicksilver/LEXIN/Hudson Motorcycles Yamaha YZF-R1 early in the race; and Fly Street Racing’s David Anthony. Those three remained in ninth, 10th and 11th in the championship point standings as all of their points remained unchanged. When Valentin Debise had a mechanical problem on the startline for the Supersport race at UMC and was forced out of the race before it started, it seemed Monster Energy/Y.E.S./Graves Yamaha’s JD Beach might have been able to breathe a little easier. But that wasn’t the case as Rickdiculous Racing’s Hayden Gillim gave him everything he had before eventually coming up 1.3 seconds short at the finish line. For Beach it was win number six on the season as he grew his championship lead over Gillim to 57 points, 190-133. Third place went to TSE Racing’s Cory West, the Arkansas resident holding off the advances of M4 medAge Suzuki’s Nick McFadden, Fastline Performance/Tuned Racing’s Braeden Ortt and SC Project/KWR’s Bryce Prince in what was a four-rider battle for the final podium spot. Quicksilver/LEXIN/Hudson Motorcycles’ Richie Escalante, Riderz Law Racing’s Michael Gilbert, YCRS/Mazziotto Racing’s Anthony Mazziotto III and Team Norris Racing’s Benjamin Smith rounded out the top 10 finishers. Liqui Moly Junior Cup: Dumas Again! In Saturday’s Liqui Moly Junior Cup race, championship points leader and KTM Orange Brigade/JP43 Training rider Alex Dumas notched his sixth victory of the season when he was able to hold off Yates Racing/Kawasaki rider Ashton Yates. Jamie Astudillo, who got the holeshot at the start, appeared to finish third, but she was issued a penalty of one second for weaving as she maneuvered her Quarterley Racing/On Track Development Kawasaki to help maintain her position. Astudillo was subsequently shuffled back to eighth in the official results, and MP13 Racing/Yamaha’s Cory Ventura was awarded the third-place trophy. The win gives Dumas a 32-point lead over Yates, 150-118. In Twins Cup, Ghetto Customs’ Chris Parrish, who hails from Tennessee, continues to enjoy his MotoAmerica nationwide summer adventure as he won his second race of the season and fifth podium in five starts. Parrish stretched out his championship lead to 27 points over Jason Madama, who was maintaining pace with Parrish until low-siding his Altus Motorsports/Yamaha FZ-07/MT-07 out of the race. Danielle Diaz, competing in only her second Twins Cup race so far this season, rode her Danielle Diaz Racing/Kawasaki Ninja 650 – a bike she borrowed from MotoAmerica operations manager Niccole Cox – to second place. Another series newcomer, Justin Filice, the son of American racing legend Jimmy Filice, ran a consistent race to bring his Team Legacy Racing/Suzuki SV650 home in third and reach the podium in his return to road racing after a near-decade-long hiatus.